It is almost Christmas Eve and we have traveled east to South Carolina. As we drove through Beaumont, Texas, Louisiana and Mississippi it was sobering to see the roofs still covered with blue plastic tarps and the trees and road signs snapped in half or blown over. As much damage as there is, it is still amazing to see how much was not touched by Rita and Katrina. A group of trees would be broken in half but another group of trees next to them would be untouched. The magic freezer is producing amazing food and treats so we are having a great time. It has been a great to make connections with folks who share an interest in great books that are NOT just for children. Thanks to all the kid lit friends for their attention and comments this year. Splendid interview with Quentin Blake in The Guardian. He discusses how his unmistakeable drawing style came about. Now 72, Blake looks much younger. His drawing style changed, he says, when he was 23. "That was when I discovered that you could be relaxed and alert at the same time; you could stop worrying - concentrate rather than worry. That was the big change. "It came about initially because I used to do roughs to send in, and sometimes the roughs came out better than the drawings, because they had more life in them. So then I started to try to build some of that spontaneity in." Many children's authors, Blake says, go back to their own childhoods for their stories. "They somehow have access to their childhood, whether it's Michael Rosen or AA Milne, they seem to get back to it. I never feel I'm doing that, in my books - what I always feel I'm doing is imitating children now. You see, I don't draw from life at all, but I do look out of my window a lot." So, are his drawings reflecting changing childhood over the years? "One has some sense that they've changed, they wear different trousers ... " he says, musingly. This on is on the top of my "can't wait" list. PublishersWeekly has a report on the Ptolemy's Gate due out Jan. 1, 2006. Jonathan Stroud will do the author tour thing in New York, Chicago, San Francisco and Miami. "There are certain aspects of the story that could be revisited, but it does feel very final," said Alessandra Balzer, Stroud's U.S. editor. "I was blown away by how he ended it and I don't mind admitting that I cried." Miramax is developing the movie. Balzer and Stroud have their own picks for casting the movie. ...an added thrill will be seeing the work make its way to the movies. A film version is currently in development; Miramax is producing, with Anthony Minghella (The English Patient) signed on to direct. "The story is incredibly visual so it'll be really interesting to see what they do with it," Balzer said. When prodded, she and Stroud are both willing to play casting director. Stroud likes Johnny Depp as the djinni, and says the role of villainous Simon Lovelace (from Amulet) was "tailor-made for Hugh Grant." Balzer gives the starring role to Jack Black as the 5,000-year-old Bartimaeus. "He may be a bit young, but it has to be somebody with a great sense of humor and an edge," Balzer said. "This is a djinni with an attitude." I read these Alex Rider books back to back because I had to know what was going to happen next. While vacationing with his friend Sabina and her family in the south of France, Alex spots the assassin Yassen Gregorovich. Soon afterwards, Sabina's father is injured in an explosion which Alex knows was no accident. The trail to Gregorovich leads him the multi-millionaire philanthropist Damian Cray who is launching a new video game system. I love the way Horowitz names his characters... Cray--computers...get it? Of course Cray is up to more than just computer games but Alex cannot convince anyone at MI6 of this. He is alone again in an attempt to save the world. The end of the book poses a question that will propel you to find Scorpia as soon as possible. These books are flat out fun to read. This story does include one of the goofier attempts on Alex's life (he finds himself in the middle of a bullfight) but I love reading them. At the end of Eagle Strike, Alex learns something about his father. He must find out the truth about his father's life and work so he is off to Venice to try and find a crime syndicate called Scorpia. This time he is on his own without any fancy gadgets or backup. When he meets Julia Rothman, one of the leaders of Scorpia, Alex is drawn into that criminal and terrorist world. He must decide what his future will be and reconcile what he learns about his father. If he joins them can he live with the consquences of the hideous attack Scorpia is planning on the city of London? I listened to this book instead of reading it so I did not have the luxury of lingering slowly over the last few pages. The end of the book is an absolute shock. Horowitz is definitely writing these books with a bow to Ian Fleming. As a reader of the original Bond books, I was struck by how much the end of this novel echoed the ambiguous endings Fleming often used. A set of Alex Rider books would make a great gift for a reader in your life. Horowitz has a new book soon-- Alex Rider: The Gadget, 2006 which includes the blueprints and the technical data for the Alex's MI6 gadgets. People who purchase books with the schematics for the Starship Enterprise would get a kick out of this book. Hollywood hopes for more gold in the children's section of the library. Fox 2000 will be developing a movie based Beverly Cleary's character Ramona Quimby. "So many kids have asked me, 'When's a Ramona movie coming out?' " Cleary said in a statement. "I'm so glad there's finally going to be one! I look forward to seeing it." Susan Katz, prexyprexy of HarperCollins kid division, said, "As Beverly Cleary turns 90, it's the ideal time to reintroduce Ramona Quimby -- and all of Mrs. Cleary's other memorable characters -- to a new generation of young people." Stephen Fry interviews JKRowling on BBC Radio 4. She discusses the importance of "fear" in literature and life. She also speaks about the series as it nears its end. Rowling admits to worrying that someone might guess how the Potter series ends. She says: "For the first time, I'm very aware that I'm close to finishing - the end is in sight. "But occasionally I get cold shivers when someone guesses at something that's very close. "Then I panic and I think it's very obvious. "And then someone says something that's so off the wall that I think 'No, clearly it's not that obvious'." In January the USPostOffice will issue a series of stamps featuring favorite Children's Book Animals. Two of the stamps — The Very Hungry Caterpillar ("The Very Hungry Caterpillar" by Eric Carle, 1969 and 1987) and Maisy ("Maisy's ABC" by Lucy Cousins, 1994 in the U.K. and 1995 in the U.S.) — will be jointly issued with the United Kingdom's Royal Mail, Jan. 10. 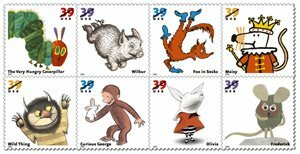 The sheet of 16 stamps also depict Wild Thing ("Where the Wild Things Are" by Maurice Sendak,1963); Curious George ("Curious George Flies A Kite" by Margaret and H.A. Rey, 1958); Wilbur ("Charlotte's Web" by E.B. White, 1952); Frederick ("Frederick" by Leo Lionni, 1967); Olivia ("Olivia" by Ian Falconer, 2000), and Fox in Socks ("Fox in Socks" by Dr. Seuss, 1965). The stamps will be issued in Findlay, Ohio. One of these days I will visit MAZZA. Another great article related to children's books appears from Karen MacPherson today. She writes about C.S. Lewis and his inspiration for the Narnia stories. Lewis himself said he first got the idea for writing the books when the young evacuees were staying at his house. But it wasn't until some years later that Lewis actually got around to writing "The Lion, the Witch and the Wardrobe," which he said began with a "picture in my head ... of a faun carrying an umbrella and parcels in a snowy wood." The picture, Lewis added, had been in his mind since he was 16; he was nearly 50 when he transformed it into the beginning of the book. Another inspiration was the wardrobe in which Lewis and his older brother Warren also used to play. The wardrobe now can be viewed at the Marion Wade Center at Wheaton College in Wheaton, Ill.
MacPherson writes a weekly column on children's books and parenting. Her articles are always of great interest. Check out her bio. Marion E. Wade Center houses a collection on Owen Barfield, G.K. Chesterton, C.S. Lewis, George MacDonald, Dorothy L. Sayers, J.R.R. Tolkien, and Charles Williams. In addition, the Wade Center has a museum where such pieces as C.S. Lewis's family wardrobe and writing desk, Charles Williams's bookcases, J.R.R. Tolkien's desk, Pauline Baynes's original map of Narnia, and a tapestry from Dorothy L. Sayers's home can be viewed. Adam is newly arrived in Honolulu and attending civilian school for the first time. His father is a naval officer on the USS Arizona. Adam and his Japanese friend Davi are fishing near the battleships in Pearl Harbor on the morning of December 7, 1941 when they see the Japanese bombers fly directly overhead. The boys are engulfed in the immediate horror and the swirling events in the days that follow. This terrific and very readable nonfiction title was a Texas Bluebonnet book. Great illustrations, diagrams and maps tell the story of the Day of Infamy. This is a superb nonfiction book to read aloud. Teachers should use this title to model how to grapple with nonfiction text. The Dear America books are well researched and try to bring a first person voice to historical events. The stories are fictional. 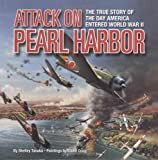 A Japanese American boy and his family must deal with the anguish and fear on the island of Oahu that followed the attack on Pearl Harbor. Tomi's best friend Billy is white and they share a love for baseball and the USA but his grandfather is waving the Japaneses flag in front of their home. Salisbury does a good job of presenting the confusing and conflicting emotions all Americans experienced in the wake of the attack. Iain Softley (The Skeleton Key) has signed on to direct Inkheart for New Line Cinema. Hey Iain, remember, Cornelia Funke wants Brendan Fraser to have the part of Mo! Labels: Books to Movies, fans obsessed with casting, Inkheart, Will Basta fans ever recover? Now this is a book-mobile! The Camel Mobile Library Service lends more than 7,000 books to nomads in Kenya's impoverished North East Province, often because camels are the only means of crossing the inhospitable terrain. Many of the books are supplied by Book Aid International, the charity which gives more than half a million books a year to some of the world's poorest countries - and is supported this year by the Observer Christmas Appeal. Fun op ed in the NYTimes today about the other dangers posed in the children's classic Good Night Moon by Margaret Wise Brown. HarperCollins recently digitally removed the cigarette from the photograph of illustrator Clement Hurd. Karen Karbo points out other "insidious" messages contained within the books covers. Very clever. H. A fire blazing in the fireplace while Bunny sleeps? Suggested change: Get rid of it. At the very least, digitally add a fire extinguisher to the wall. And hello? Where are the smoke detectors? I. The United States Fire Administration advises against using "alternative heating devices" like fires to dry clothing. Suggested change: Digitally move mittens and socks to other end of the room. "There should be one second of magic as you open a page of a book," adds Sabuda, giving a tour of his "studio" on Manhattan's Upper West Side. Great profile on Robert Sabuda. His book Encyclopedia Prehistorica Dinosaurs is on the Texas Bluebonnet list for next year! This title is simply amazing. Great pick , I predict it will be the Bluebonnet winner in 2007. Watching BBCAmerica last night, Silent Witness: A time to heal. I listened to a group of high school students bemoaning the books they "had" to read for their English classes. What intrigued me was when they mentioned Fahrenheit 451 as one of the titles they were reading, each one of them commented "That is a great (cool, awesome) book." Apparently the power of Bradbury's story cannot be overcome by teaching it. The kids still love that book.